FALL 2014: LAND TO TABLE CALIFORNIA'S HEARST RANCH T hank god for the Hearst family and their ability to preserve and care for such a large tract of fabulous California land and continue the heritage and tradition of cattle ranching. 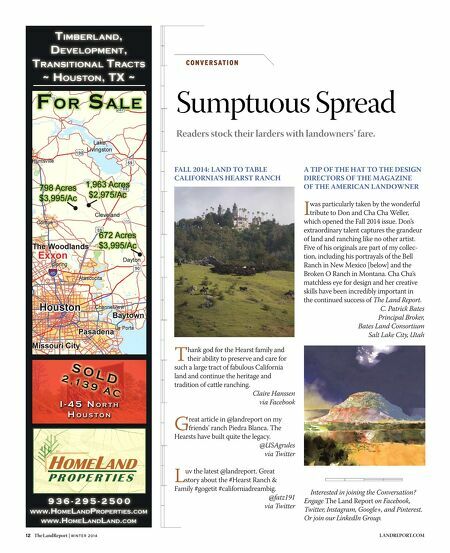 Claire Hanssen via Facebook G reat article in @landreport on my friends' ranch Piedra Blanca. The Hearsts have built quite the legacy. @USAgrules via Twitter L uv the latest @landreport. 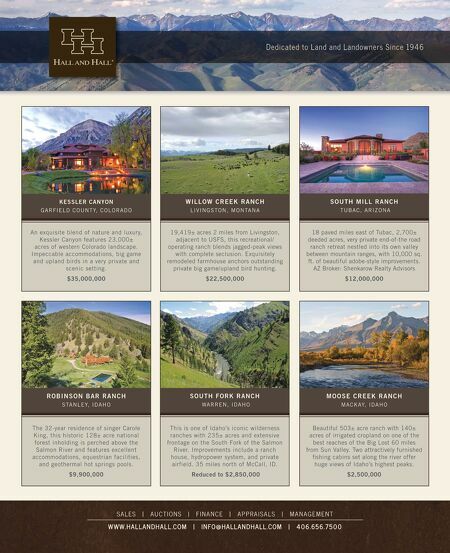 Great story about the #Hearst Ranch & Family #gogetit #californiadreambig. @fatz191 via Twitter A TIP OF THE HAT TO THE DESIGN DIRECTORS OF THE MAGAZINE OF THE AMERICAN LANDOWNER I was particularly taken by the wonderful tribute to Don and Cha Cha Weller, which opened the Fall 2014 issue. Don's extraordinary talent captures the grandeur of land and ranching like no other artist. Five of his originals are part of my collec- tion, including his portrayals of the Bell Ranch in New Mexico [below] and the Broken O Ranch in Montana. Cha Cha's matchless eye for design and her creative skills have been incredibly important in the continued success of The Land Report. C. Patrick Bates Principal Broker, Bates Land Consortium Salt Lake City, Utah 12 The LandReport | W I N T E R 2 0 1 4 LANDREPORT.COM C O N V E R S AT I O N Sumptuous Spread Readers stock their larders with landowners' fare. Interested in joining the Conversation? Engage The Land Report on Facebook, Twitter, Instagram, Google+, and Pinterest. Or join our LinkedIn Group.